San Pedro could easily be considered a community success story of lionfish management. Popular snorkel and dive sites have very little lionfish. They are mostly found at reefs that are not regularly visited. However, the importance of continued education and hunting of lionfish is still considered a necessary priority. Dive operators and guides celebrate the reef each year with their marine reserve partners by engaging in a weeklong celebration called Reef Week Hol Chan. Teams are dedicating May 12th to cull lionfish through a fun filled tournament that involves guests and the wider community. 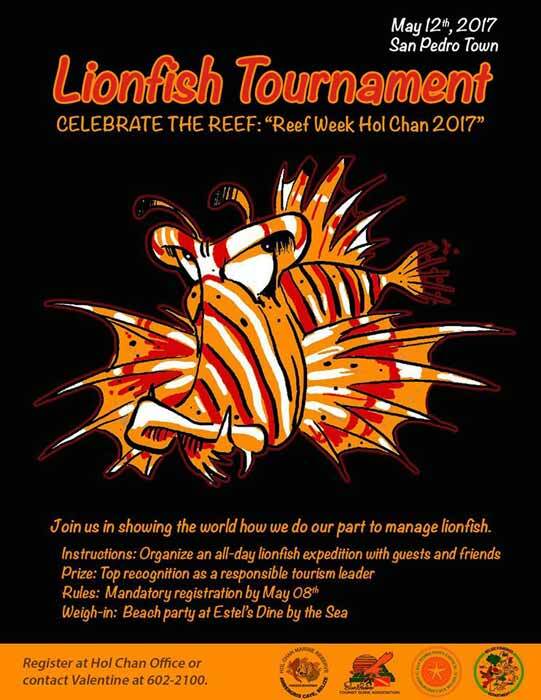 Estel’s Dine by the Sea hosted a Lionfish Tournament on Friday, May 12th, as part of the 12th annual Reef Week celebration. Not only was it an opportunity to win great prizes, but the tournament also raised awareness on the invasive species. Lionfish are an invasive species who are voracious eaters and have no natural predator. They are a threat to our marine life as they continue to gobble juvenile crab, lobster, conchs, and fish. Four registered teams and one fun group managed to capture a total of 554 lionfish. Amigos Del Mar, Ramon’s Village, C-Monkey, Belize Diving Adventures, and Passion Kite Belize (fun team) headed out to the sea, and by 3PM, began arriving with coolers full of lionfish. After all teams had come onshore, their catch was counted, and the largest and smallest lionfish were measured. After points were tallied, Amigos Del Mar was declared the winner with 240 lionfish. Ramon’s also had the largest catch of the event, with a lionfish measuring at 36.8 centimeters. The country of Belize hosts various Lionfish tournaments throughout the country (year) to promote the eradication of the invasive species from our Barrier Reef. The tournament is a fun way to teach everyone the importance of keeping the Lionfish population down in order to preserve other fish species vital to the survival of the coral reef. 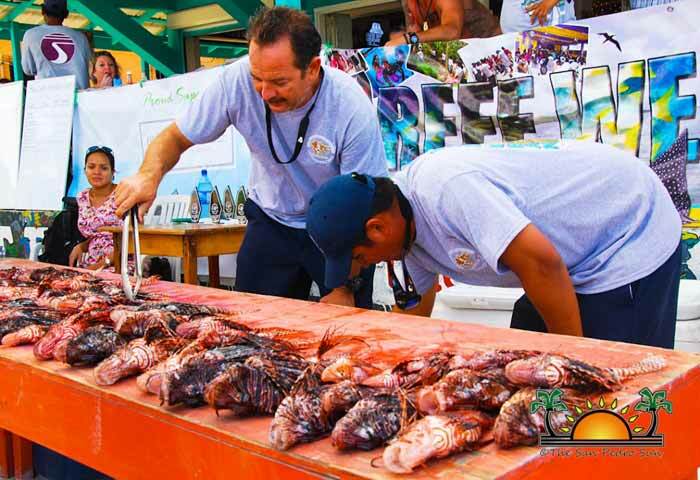 The country of Belize hosts various Lionfish tournaments throughout the country (year) to promote the eradication of the invasive species from our Barrier Reef.